Apple did not bundle a calculator app with the iPad, but Shift Apps is ready to fill the void. 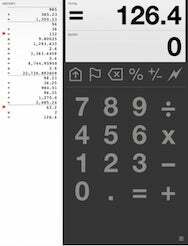 The company’s new iPad app, Digits Calculator, is a minimalistic and simple calculator app that nevertheless has some powerful features. The spartan interface is mostly dominated by the familiar arrangement of numbers and mathematical operators and has a few additional buttons for the Scrollback and Flagging features. The left side of the app contains the history tape, which displays a running record of all the calculations as you perform them. The Scrollback button lets you erase lines from the history tape and the Flag button adds a flag next to the calculations you want to highlight. The settings screen has options for changing the background color of the app and the history tape, turning scientific notation on or off, and specifying whether you want the app to resume from where you left off or give you a clear slate every time you launch it. Digits Calculator is currently available for $1 on the App Store and is compatible with any iPad running iPhone OS 3.2 or later.